Now that the fall season has arrived, those who were so busy in the summer maintaining and fertilizing warm season grasses (Bermuda, Zoysia, Centipede, and St. Augustine) are now able to sit back and enjoy one of the benefits of those types of grasses – dormancy. As these warm season grasses wind their growing season down, its time for my Fescue friends to prepare for the busiest time of year for cool season lawn maintenance, renovation, and establishment. So, with that said, this fall edition will be focusing primarily on all the to-do’s of the Fescue (Cool Season) turf owners. Because Fescue has an active growing season during the autumn months, this is the best time of year to do whatever work is necessary to have a great looking lawn by spring, and one that will better able to endure hot humid summers, that cool season grasses are not fond of. Fall is the ideal time to focus on Fescue maintenance because the roots will have plenty of time to establish themselves by spring. By the time summer gets here, you want fescue roots to be as strong and deep as possible, and working your turf in the fall, gives you the best chance of success for serious establishment by next summer. The ideal window to overseed or seed cool season lawns in the southeast is between September 15, and October 15. The cooler soil gets, the slower the germination time becomes. A soil test will really help you apply the optimum levels of nutrients. This includes lime, nitrogen, phosphorous, and potassium. A good soil test (one done through your County Extension Service) will tell you this important information and more. A practice I like to use is to always aerate my fescue lawn in the fall, just prior to overseeding. This has several benefits. By aerating with a “core aerator”, I am invigorating my root zone, by increasing oxygen in the soil, and creating openings in which my lime and starter fertilizer have a place to go. This is especially helpful if you are adding lime. Lime does not move through the soil quickly, and it takes a couple of months to really be effective, so by getting the lime spread just after aerating, really helps get it down into your soil. Same goes for any fertilization you may be doing. The cores, which get pulled from your soil, are only unsightly for a short while. Any rain or irrigation you do will quickly cause these cores to break down and wash back into the ground. A general rule is that if you still have about 50% of your lawn growing, than you can overseed with good results. However, if more than 50% has died, than you may want to consider starting over. This includes killing the remaining grass and weeds with a non-selective herbicide. Then seven days later, you can safely seed or sod your entire lawn area. Once the seed is down, good seed to soil contact is critical for good germination. I like to rent a water filled roller to go over my newly seeded lawn area to ensure good seed to soil contact. After you seed, you might also want to mulch with wheat straw. This will help keep the seeds moist, and keep the birds away. Be careful to buy good quality straw. Otherwise you may end up with Hay, and end up with a bail full of seed heads that will quickly sprout and be unsightly mixed with the fescue. Once all this is done make sure you keep your seeds moist until germination. This may mean watering briefly several times a day. Once you get germination, start to taper off you watering, until the lawn is getting about an inch each week. 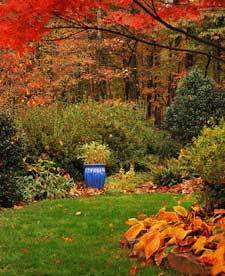 Fescue lawns should be fertilized twice in the fall, ideally in mid-September, and again in mid-November. Most any lawn fertilizer will do. It is a good idea to spot treat problem weeds up to seven days before you plan on seeding. You may then apply pre-emergent weed control in late fall or early winter, but only after your newly seeded lawn is well established. This will prevent winter annual weeds from being a problem in early spring. Fescue lawns admittedly are the most labor intensive turf types, but to many, the bit of extra work is worth it! They are rewarded with year round, beautiful green lawns.